-Much anticipated Yonekichi soft-opened with rice burgers and shaken fries. There was about 30 min wait last Monday. -Rice burgers have been popular in Japan since the fast food chain, MOS Burger first introduced in 1987. I recall all the rage when they were first released. -Fultummy's in Brooklyn (now closed) used to serve good rice burgers in NYC. 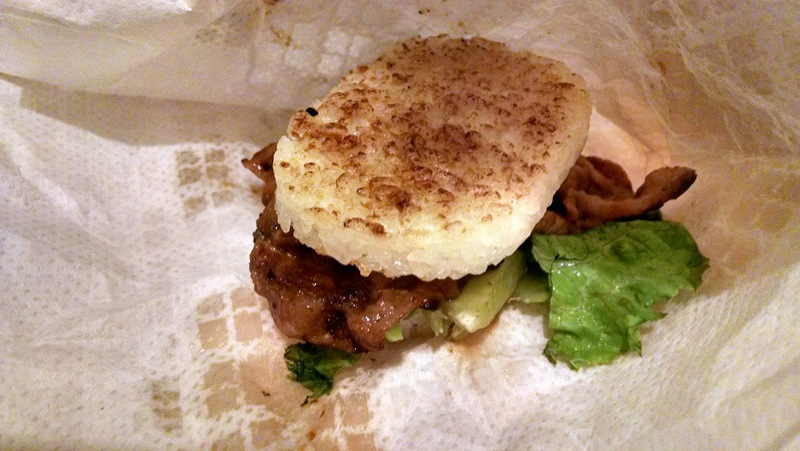 Yonekichi is the first spot to specialize in rice burger in the city. 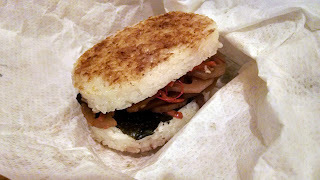 -They don't travel very well - The rice buns were dry, and overall it was quite salty. But the kinpira ($6.50) was tasty and the pork shoulder, Ginger Mugifui ($8.00), was well seasoned and tender. -Shaken fries with plumkombu-cha and sansho pepper was also salty (even after shaken), but it could taste amazing if the seasoning ratio is re-considered.